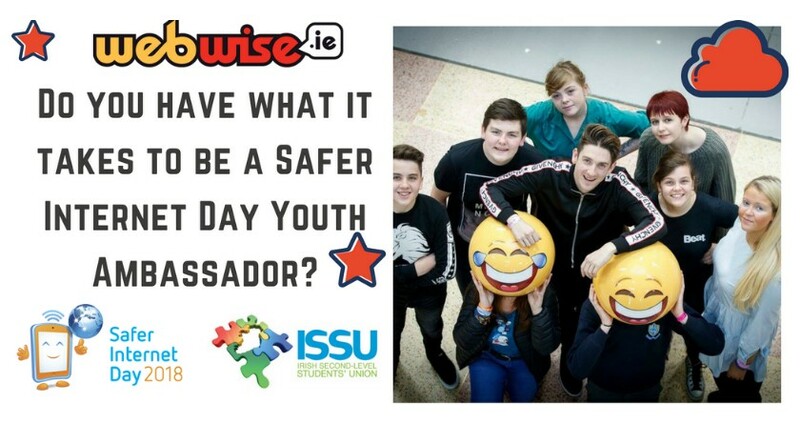 Webwise are looking for Safer Internet ambassadors, to train and lead an anti-bullying and internet safety awareness campaign in your school, club or community. It is a great opportunity to learn new skills and meet some fantastic people from post primary schools all over the country! If you are a confident speaker, enjoy planning events and bringing people together, then we want to hear from you! You can sign up or nominate someone! All the ambassadors will be invited to Dublin to complete training with Webwise, Ireland’s Internet Safety and Awareness Centre. The Webwise team will teach you everything you need to know about leading your Internet Safety Initiative in your school. It is also a really fun day out! Training will be carried out on the 10th January, 11.00 am – 3.30pm in Facebook HQ Dublin. Why join the Safer Internet Day Ambassador Programme? Ambassadors receive free online and offline training from the Webwise team and members of ISSU (Irish Second-Level Students Union). SID Ambassadors will develop teamwork and communication skills and will also learn about leadership. This is a great way to get positively involved with your school, being heard and to meet other students from across Ireland. Maybe you have been affected by cyber-bullying or know someone who has? Raise awareness! Get involved. Simply fill in the form here. Please note: SID Ambassador places are limited. If you miss out, don’t worry you can still take part in Safer Internet Day 2018. Get some ideas on how to get involved here. We look forward to hearing from you!